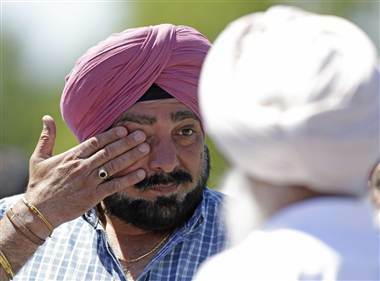 As dozens of Sikh worshippers gathered for worship at their gurdwara in Oak Creek Wisconsin this morning, at least one gunman burst in and unleashed a hail of bullets, wounding 25 and killing six. It has been stated that one gunman has been shot, but reports indicate that there could be at least one other gunman at large. The dead killer has been described as a “balding white male armed with two handguns.” Other sources have described him as possessing tattoos but have not disclosed their type, and the Milwaukee-Wisconsin Journal Sentinel claims that he was a single army veteran in his forties. The motive for the crime has yet to be ascertained, but as many past mass shootings in the US have illustrated - such as the recent case in Colorado at a premier of the latest Batman film – there may be no rationalisation for this crime other than the psychologically disturbed nature of the killer or killers. Given that at least one, if not the only perpetrator of today’s crime, lies dead, it may not be possible to ascertain what rationalisation the gunman employed. It may be the case that he was in dispute with at least one of the Sikh worshippers, but owing to the indiscriminate nature of the carnage, it would seem more likely that he bore some general hatred of Sikhs. This could well be rooted in a warped fundamentalist vision of Christianity, or then again, the man could have been a militant Islamist. Alternatively, he or they could have held some sort of deranged Breivikian beliefs and mistaken the Sikhs for Muslims. Such mistaken identification accounts for the sad fact that over 700 anti-Sikh attacks are reported to have taken place in the US since 9/11. The Associated Press also states that following today's incident, the New York Police Department is increasing security at gurdwaras in the city, and ABC News reveals that it is being officially treated as a "domestic terrorist" incident. Hopefully, no further victims have died, and local medics have been able to minimise the suffering of, and long-term effects to, the wounded. The victims and their relatives deserve the sympathy of all. In a country that values so strongly the right to bear arms, perhaps the time has come for it to reconsider the nature of the arms in question. Although we have our own problems with guncrime in the UK and occasional multiple killings do take place, the general absence of firearms amongst our population helps to make our society a safer place. Quite why any US citizen would require automatic weaponry is beyond me, but then again, I am not an American, and gun ownership is not in my cultural DNA. They keep guns in case the pesky Brits try to wrestle the colony back and France isn't around to help them. This is a terrible crime but there is no way any politician will advocate tighter gun controls, its even less likely during the run up to the election. Where would they be without the French? After all, they even created the greatest American icon: the Statue of Liberty. I think that you're right with respect to the complete political reluctance to reign in gun ownership in the US, particularly this year.